CARBONDALE, I.L. 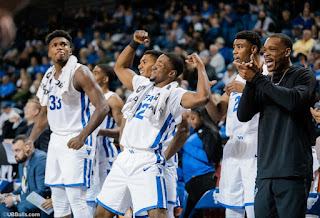 -- For the first time in school history the University at Buffalo men's basketball team has earned a national ranking as they are ranked #25 in the latest Associated Press poll, which was released today. The Bulls are 2-0 heading into tonight's game at Southern Illinois, which will tip off at 8pm on ESPN+. Buffalo received the national ranking after a big victory Friday night at then nationally-ranked West Virginia, a 99-94 overtime win. Buffalo received 154 points in the poll, good for the 25th spot, just one point away from #24 and future opponent, Marquette. Duke received 48 first place votes and is ranked #1 with 1,606 points. Buffalo become the first Mid-American Conference team to be ranked in the Associated Press poll since Kent State was ranked 23rd on February 25, 2008. The Bulls have earned numerous recognitions following their strong start to the season. CJ Massinburg was named the MAC Player of the Week as well as the Lute Olson National Player of the Week by Collegeinsider.com. Andy Katz, who currently covers college basketball for NCAA.com, has Buffalo listed #16 in latest Power 36 and he also named Massinburg as his national player of the week.